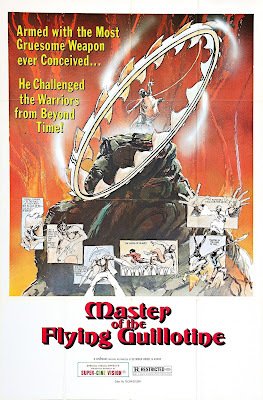 Master of the Flying Guillotine was a film that always eluded me. When I first got into martial arts films in the early 90s, I studied a lot of actors, directors, you name it. Everyone would always talk about how great Jackie Chan and Bruce Lee and Sammo Hung were, but there was always a name that came up that intrigued me: Jimmy Wang Yu. Wang Yu is the star of Master of the Flying Guillotine and when I found out about the film I knew that I needed to see it. The problem was, I couldn't find it. The few times I did, the print was always zoomed in, the subtitles were impossible to read, and the film made no sense. I thought that I would never get to see the film. Then in the early 2000s, a company called PathFinder Home Entertainment released the film on dvd, not once, but twice and, while the print was damaged, the film was in the proper aspect ratio, the subtitles were easy to read, and the film made sense. All of my dreams came true with that first release. I fell in love with the film like I hoped I would and watch the film at least once a year.